Today’s impressive project takes us to the luxurious island of Ibiza. Famed for its wild nightlife and raucous dance clubs, the Spanish island of Ibiza has another more surprising side; an opulent residential district filled with a high-level of architectural design, and a welcoming, family friendly ambience. 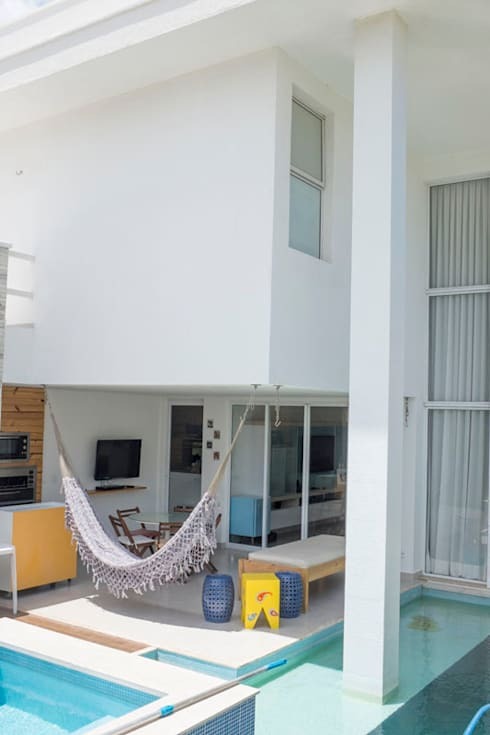 Exuding modernity and contemporary character, Casa Ibiza, as it is known, is a fresh cubist-esque home with a sense of refinement and simplicity. 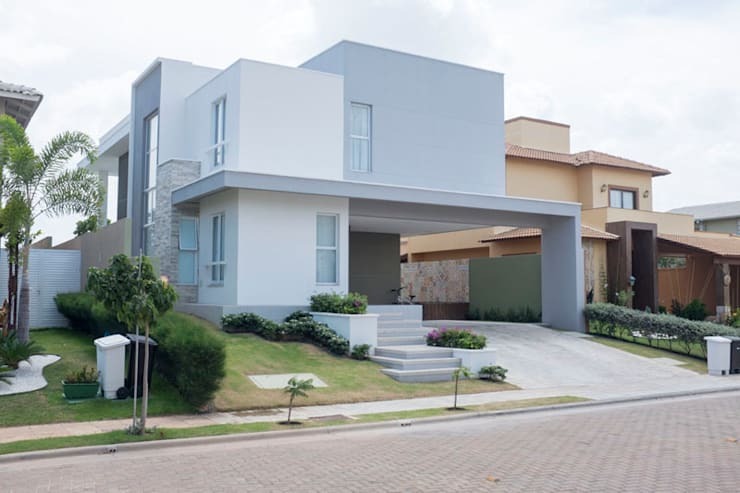 Designed by Poché Arquitectura, the residence boasts spacious living quarters, an open-plan layout, as well as plenty of lavish accessories and eye-catching features. If this sounds like something that might interest you, come with us and take a tour of us by checking out the gorgeous images below! Looking at the house directly, we are able to see the entrance to the residence is located by wandering up the concrete stairs. To the right of this there is a neat carport, offering a handy and easily accessibly thoroughfare to the front door. 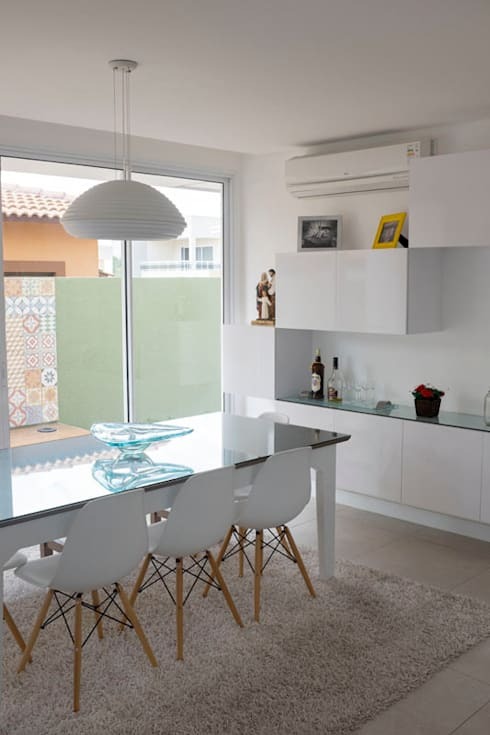 The colour scheme chosen for Casa Ibiza is muted and monochromatic. This helps the dwelling fit in with the surrounding landscape, as well as infuse a sense of modernity and chic contemporary style. Next up, we take a look at the property from a different angle. Here we are given a better indication of the home’s modernist roots. Situated within extensive grounds, the structure is located in a central position, surrounded by walkways that circle each external wall. 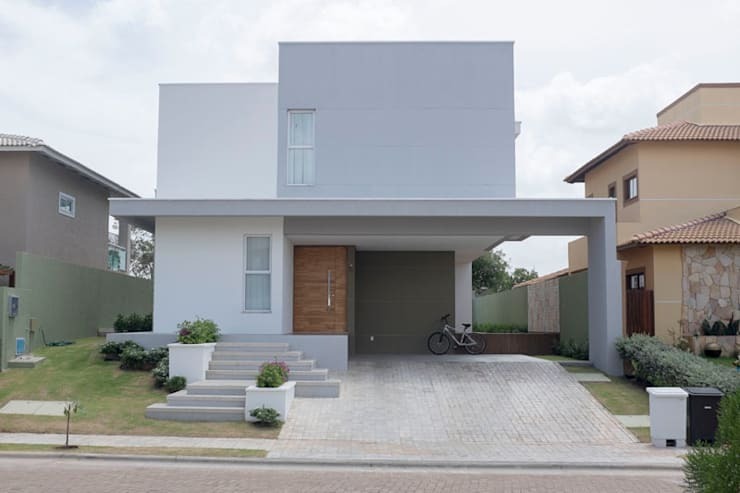 The front façade of the residence consists of small discreet windows ensuring the dwelling remains private and away from the neighbours’ prying eyes. However, as we will see the rear area and living zone opens outward, providing an open yet segregated back garden. Superbly unpretentious in its approach to design, the architects have driven this project by focusing on volumetric alignment and an unfussy sense of sophistication. Perched on its plot that features a gentle incline, there is barely a need for a boundary enclosure. Next up we enter the home, and wander into the living space. It is here that we are greeted by a double-height ceiling, as well as bright and airy internal spaces. 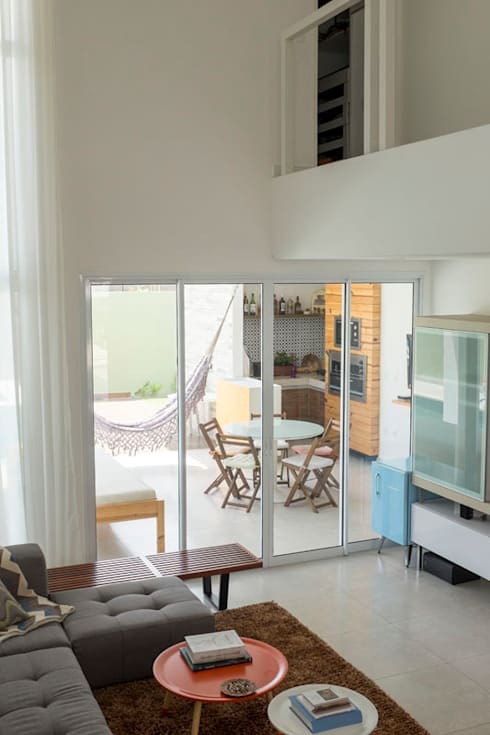 Well ventilated and replete with ample natural light, this room is decorated to suit a casual yet comfortable island lifestyle. With touches of colour enlivening the muted palette, this is a sumptuous and highly inviting space. Do you like the way each element is beautifully considered and implemented? To achieve this in your own dwelling, chat to a professional and get some expert design and decorative advice. Within the dining room, the relaxed Ibizan aesthetic is continued. Here the colour scheme is predominantly white, with several burst of colour, added to impart life and energy within the room. We love the bespoke built-in joinery that sits to the side of the space, offering an area for bar drinks, tableware, and barware to be stored. Designed with family living in mind, the open layout and floor plan create a welcoming and relaxed ambience. Sliding doors bring the outdoors 'indoors', while filling the large internal spaces with an abundance of natural illumination. Each area of the dwelling has been thought through and considered. An astute attention to detail brings the home an overall sophistication and refinement; while furnishings, fittings and fixtures are still light, colourful and highly usable. The final image we are taking a peek at before we complete our tour is the outdoor garden and socialising space. Perfect for hosting an event or party, this area is an entertainer's paradise! 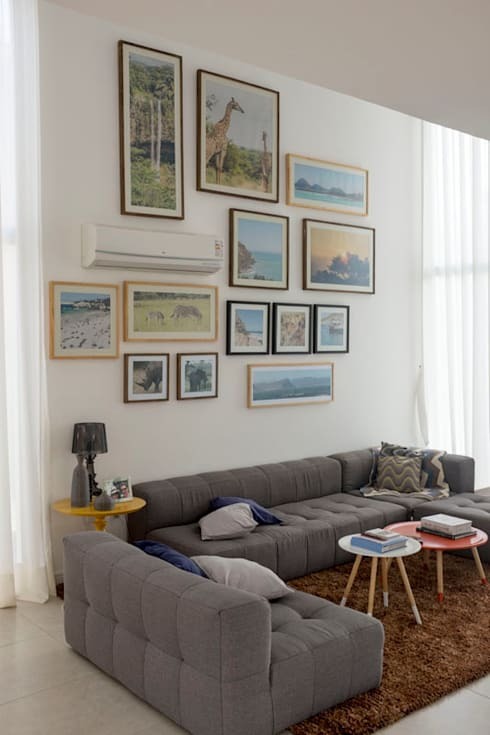 It is in this image that we are able to see the way the double height space works within the home. Large panels of glass form huge windows, which really help the interior to feel light, bright and airy. Adding a personal touch to the space, a hammock is undeniably the best seat in the house. Positioned for summer sunbathing, and ideally situated directly next to the shimmering turquoise pool, this is unquestionably a year round dream dwelling. What did you think of this sleek island home? Let us know what you liked (or disliked) in the comments below!